It’s b-aaack. Meatless Monday post that is. My garden is literally overflowing with ruby red chard so I tried to think of a new way to incorporate the veggie into something seasonally delicious. 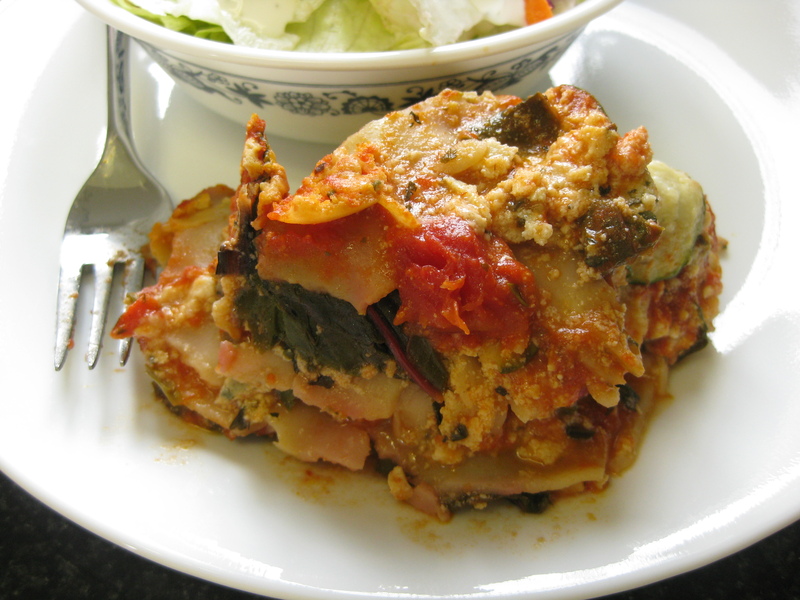 Spinach lasagna is good, so why not sub in chard, it works really well! 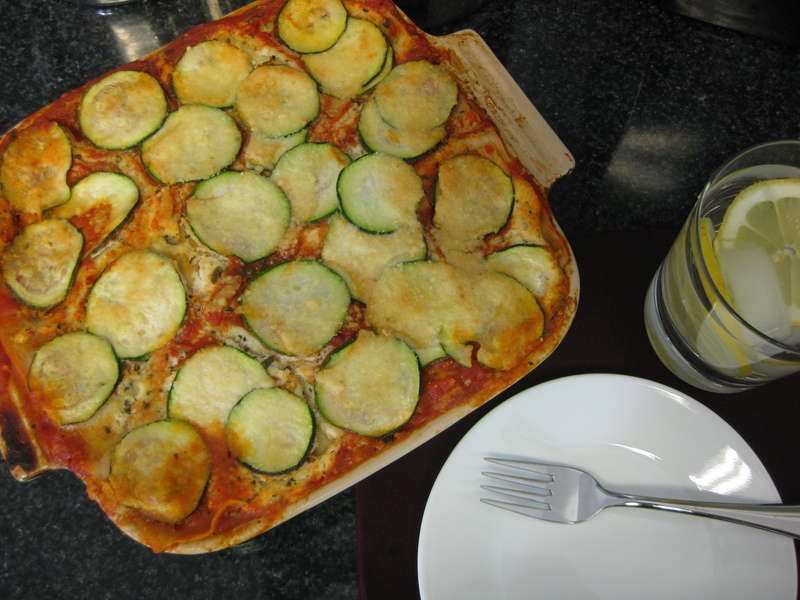 I threw in some thinly sliced zucchini, another abundant summer veggie. I think this is a healthier version of your traditional lasagna because it isn’t swimming in cheese, bechamel sauce or ground beef. It’s overflowing with yummy fresh veggies, light and healthy. Enjoy! Preheat oven to 400°. In a medium bowl, combine the ricotta cheese, egg, spices, lemon peel and salt and pepper, mix well. 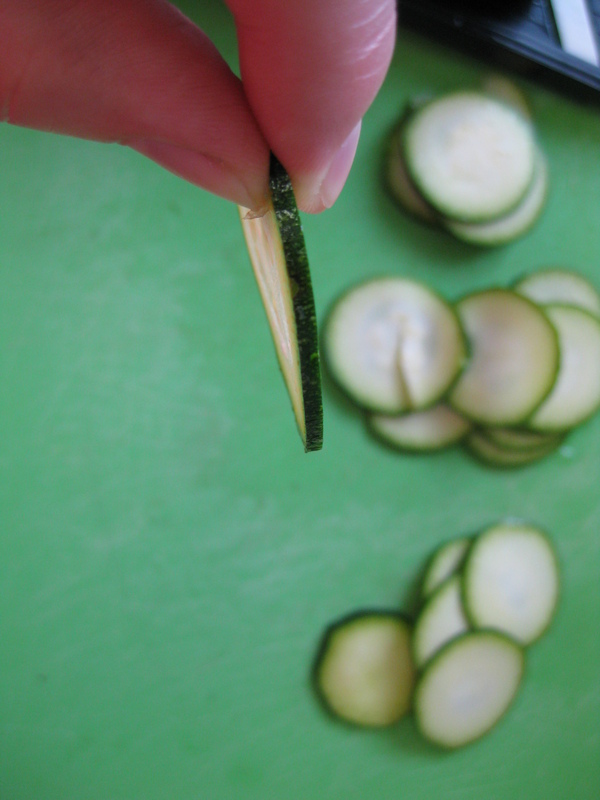 Chop the swiss chard and very thinly slice the zucchini, I used a mandolin to get the right thinness. Quickly sauteé the Swiss chard until it begins to wilt and reduce in size. It should cook down to about 2 cups. This step is important because it releases the excess water from the chard, which would otherwise come out during baking and make the lasagna soggy. Fill a large baking sheet with hot tap water. Soak the noodles for 5 minutes. This helps the noodle retain a good texture without drying out the lasagna. Spray a 9×9 inch baking pan with cooking spray. Spoon some marinara sauce and ricotta cheese on the bottom, then top with two lasagna noodles. The noodles should overlap in the center a bit and will not reach to the edges of the pan. That is ok, they will expand during baking. On top of the first layer of noodles, 1) spread ricotta cheese, 2) then swiss chard, 3) then zucchini slices and 4) finish with some marinara sauce. Add another layer of lasagna, then repeat the layering as above. After you’ve layered the last of the noodles, finish the top of the lasagna off with zucchini slices and then cover with Parmesan cheese. Cover the pan tightly with tinfoil. Put the pan on a foil lined baking sheet (because it may bubble over and make a mess if you don’t) and place in the oven. Turn the oven down to 375°. Bake for 50-55 minutes. Remove the tinfoil, and bake uncovered for 10 more minutes, the cheese will brown a little. Let the lasagna stand for 10-15 minutes before slicing. 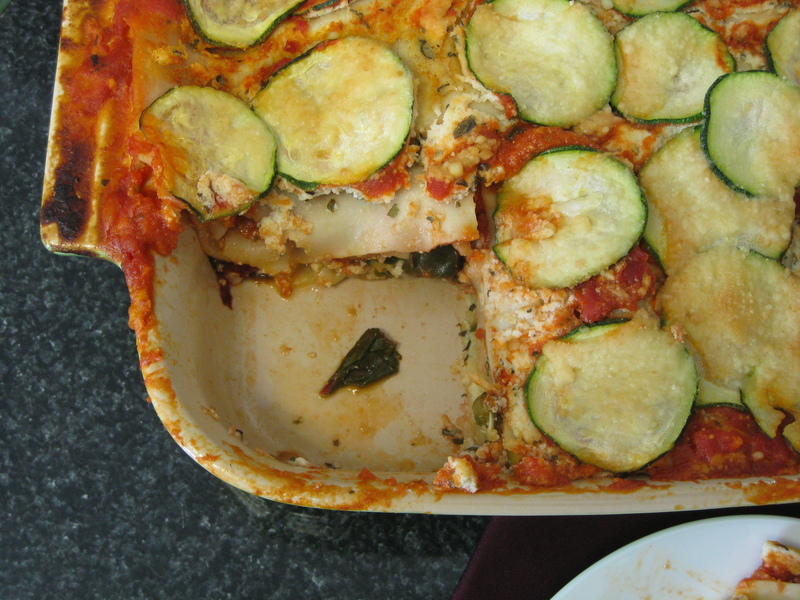 This entry was posted in pasta, vegetarian and tagged gardening, lasagna, marinara, meatless monday, no-boil lasagna noodles, ricotta cheese, summer lasagna, swiss chard, zucchini. Bookmark the permalink. 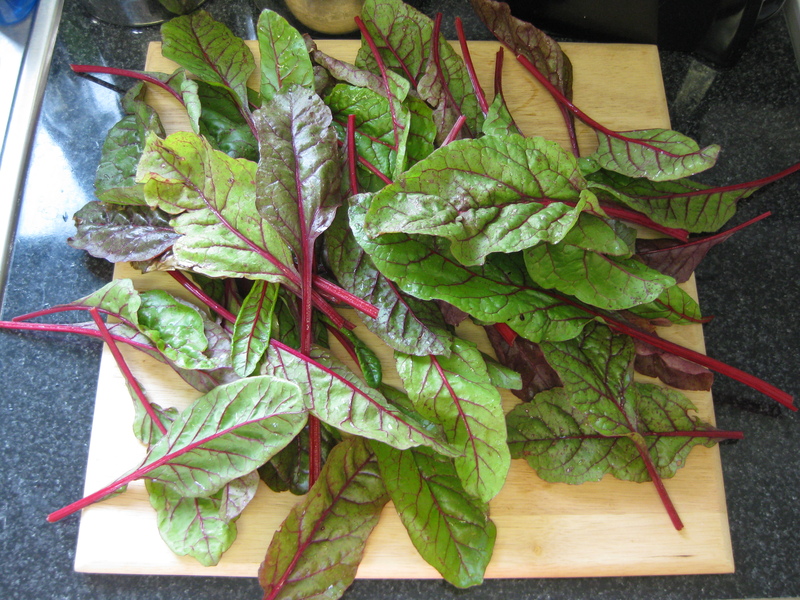 What a great idea to use Swiss chard. It’s been a while since I’ve had spinach lasagna. I think I’ve got to try making it this way some time. Great recipe and super photos!